Authenticity is a major theme in scholarship on rhythm and blues (R&B), which poses some interesting challenges for my work on how R&B travels transnationally. Some writers define authenticity in R&B solely in terms of the experiences of African Americans, deeming crossover beyond the black community as pandering to the mainstream (read white people). Others take the hybridity of black music as their starting point and suggest alternative ways of reading the appeal of R&B beyond American blacks. The centrality of music aesthetics as well as audience agency proves most useful for my work. For some, R&B is defined by its reflection of black life. Nelson George throws down the gauntlet in The Death of Rhythm and Blues when he links R&B to black life that revolves around “a black community forged by common political, economic and geographic conditions” (x-xi). R&B “becomes a sad shell of itself” in the midst of attempts to crossover and appeal to non-blacks: “As a result of these broad social changes [that include assimilation], black culture, and especially R&B music, has atrophied. The music is just not as gutsy, or spirited or tuned into the needs of its core audience as it once was” (xii). For George, R&B’s core audience is black, while the crossover audience is white. But what about other kinds of audiences that have embraced R&B? However, when R&B is valued for its aesthetic as well as socio-economic value, hybridity challenges such reductive racial authentication. In The New Blue Music: Changes in Rhythm & Blues, 1950-1999, Richard J. Ripani takes issue with George’s perception that “the music had a greater degree of ‘blackness,’ up to the late 1980s, by which time, he believes, that the potential for crossover success by black artists had sapped the music of its African-American cultural strength” (12). Because R&B is a hybrid musical form where “every rhythm & blues song is a blend, more or less, of inherited AFrican and European musical styles. . . . it seems folly to try to determine which have a sufficient degree of a given musical characteristic to be considered ‘real. '” (8). Instead, Ripani identifies elements of the blues system incorporated in the many genres under the umbrella of R&B. Brian Ward complements this approach by focusing on the creativity in the music itself in Just My Soul Responding: Rhythm and Blues, Black Consciousness and Race Relations: “This sort of racial essentialism actually undervalues the dazzling complexity and syncretic brilliance which have characterized black American musical forms in favour of a desperate search for African roots and retentions, as if these comprised the only criteria for evaluating the worth and relevance of contemporary African American music” (11). Moving the interpretative lens to music aesthetics also allows for a fuller exploration of audiences, and in terms of my work, opens up the way to exploring how black music travels and speaks to non-blacks. Ward recognizes the agency of diverse audiences: “Those meanings were also constructed by individual and collective listeners, sometimes in ways which defied the initial intentions of the artists involved and transcended the economic priorities and racial conventions of the industry within which they worked. Black and white audiences could. . . shape the social and political meanings of musical products by the manner of their consumption” (5). Focusing on the music, the thing that diverse audiences engage, allows me to understand how black music is embraced in its many forms by K-pop, beyond lyrics. Clearly, there is something in the music that resonates with non-black audiences. Ward and Ripani helps me to work out the meanings of music aesthetics that are embraced by transnational audiences. 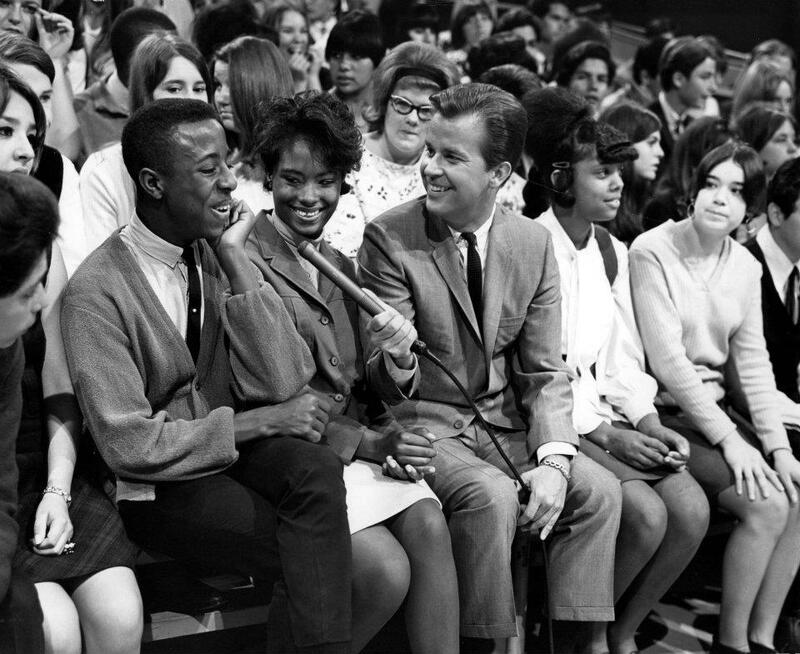 Image: “American Bandstand, 1960s.” Facebook. N.d. Web. 7 Aug 2014. George, Nelson. The Death of Rhythm and Blues. New York: Penguin Books, 1988. Ripani, Richard J. The New Blue Music: Changes in Rhythm and Blues, 1950-1999. Jackson: University of Mississippi Press, 2006. Can’t wait to read your book ! Thank you so much! Your work has really shaped my thinking about the musical meaning of R&B.